For years you have heard fire departments promote smoke alarms as being necessary to alert your family in the event of a fire in your home. Smoke alarms are necessary, so keep them working. However, smoke alarms only alert you. If there is a fire, the fire keeps burning when the smoke alarm goes off, and you may only have a few seconds to escape. 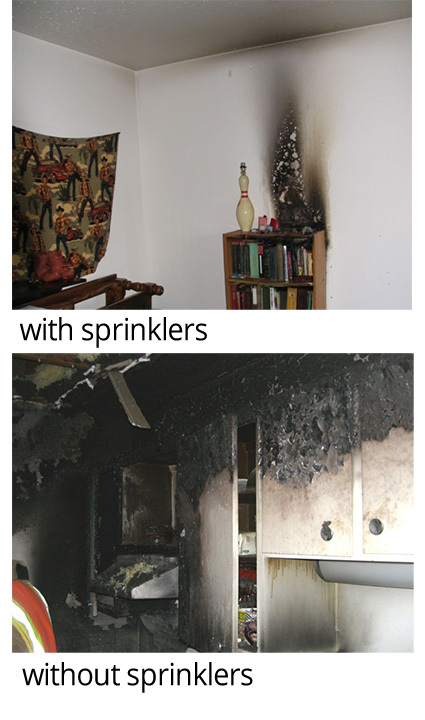 Fire sprinklers actually help control or put out the fire! This gives your family even longer to escape and help firefighters put the fire out. Home fire sprinklers have been available for more than 30 years. Reports and studies have demonstrated that home fire sprinklers make a big difference in your family’s life and your community. Insurance companies provide a discount when home fire sprinklers are installed. The video to the left shows a side-by-side fire sprinkler demonstration. This shows a comparison of how fire sprinklers work and what happens when there are no fire sprinklers. At the end, you will see the destruction and devastation that occurs from a home fire without sprinklers and the lack of destruction with fire sprinklers. Be sure to watch this in full screen. In Ashland, fire sprinklers have been installed for about 20 years when the home location is not able to meet fire apparatus access or water supply for firefighting. More than 150 single family homes have fire sprinklers installed. Here's a brochure that shows fires that occurred in Ashland with and without fire sprinklers.